The Lorne Sculpture Biennale closed on March 30th, so this post is a little slow in coming! It has been a busy couple of months (curating exhibitions, etc) so it has taken me a while to organise my thoughts and reflect on the exhibition. The show has three categories – the Sculpture Trail featuring large works along the beach front, the Small Sculpture Show, and SculptureScape featuring temporary works made in situ by twenty artists over the four weekends of the show. I participated in the SculptureScape section on the opening weekend of the show, and also attended the closing weekend, so saw nine ScuptureScape works. The SculptureScape category is intended to be interactive, with Biennale visitors, and anyone else spending a day in Lorne, being able to observe the creative practice of the maker, ask questions, and in some instances participate in the creative process. 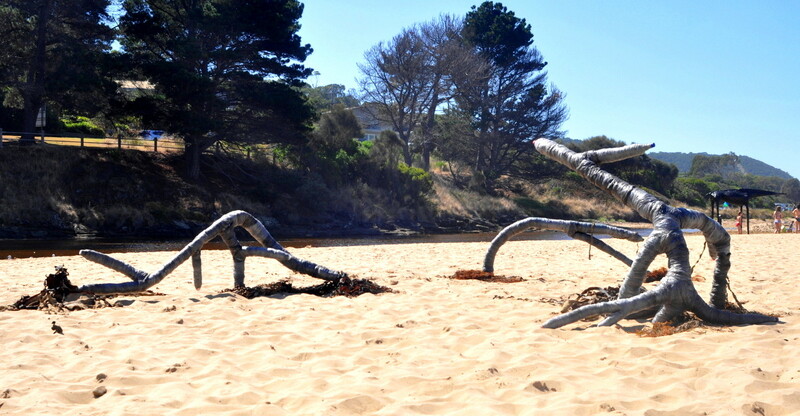 The Lorne Scuplture Biennale is currently the only “sculpture trail’ type show with this type of category. Peter Burke’s Ban the Biennale invited public participation by asking people to create placards with questions or statements intended to generate discussion about what art actually is. Signs such “How can Art change the World” and “Where is the Plinth” were installed around the lone protester (Peter Burke) tent, where he sat to give the public ‘information’. When he wasn’t in his tent he was riding a tricycle around the town broadcasting questions and statements taken from the placards through a megaphone. By the end of the weekend his tent was surrounded by a sea of placards of all sizes and colours and asking lots of questions about the meaning of art. As a project it was very successful with people eagerly wanting to make a placard and write something radical. Though many people would have joined in because of the seeming disobedience the project, it did promote a discussion about art amongst people who may not have given these concepts much consideration beforehand. Urban Debris was an installation of three large forms resembling tree branches made from plastic drink bottles and supermarket plastic bags, created in situ by Kate Gorman. Currently her art practice involves investigating a range of materials that enable her to explore human perceptions of landscape and nature. Gorman’s use of plastic bags and bottles on the Lorne foreshore highlights the impact our modern throw-away society has on the ocean and coastal environment. Keegel installed her collected paper bags in colonies along tree branches and crevices, an infection of self devourment. Although she had been collecting paper bags over a period of time, Keegel needed more and asked passersby to donate any paper bags they had (take away food-ironically fulfilling the masquerading environmental choice) and scrunch them into organic forms that were added to the artwork as it evolved. AND Forest was the winner within this category – I must say it was one of my favourite works! The front lawns of the Uniting Church were temporarily transformed into a sea of colour by Anthony Sawrey with his work Level Check. Trained as a painter Sawrey found studio art too limiting at times and has been recently creating large outdoor works using organic line marking fluid and an industrial spray pump, an artform he calls Environmental Painting. The end result of this grassy intervention certainly stopped early Autumn Lorne visitors in their tracks! Hills uses the jellyfish as a metaphor to address this question. Jellyfish live in a constant flux, being washed up onto the shore, then being reclaimed by the sea. The jellyfish Hills creates, however, are in the shape of peta bottle bases and other consumerist throwaway objects. So, in order to survive advances in technology we must morph and become more like it? A short stroll away Laine Hogarty was installing Line in the Sand with the help of volunteering spectators. Like much of her artwork, Line in the Sand is constructed from recycled materials used to highlight themes of sustainability and repurposing. Comprised of plastic shopping bags filled with sand and installed as a boundary line, the artwork literally drew a line in the sound, thereby raising awareness regarding the use of plastics and their impact on the natural environment. 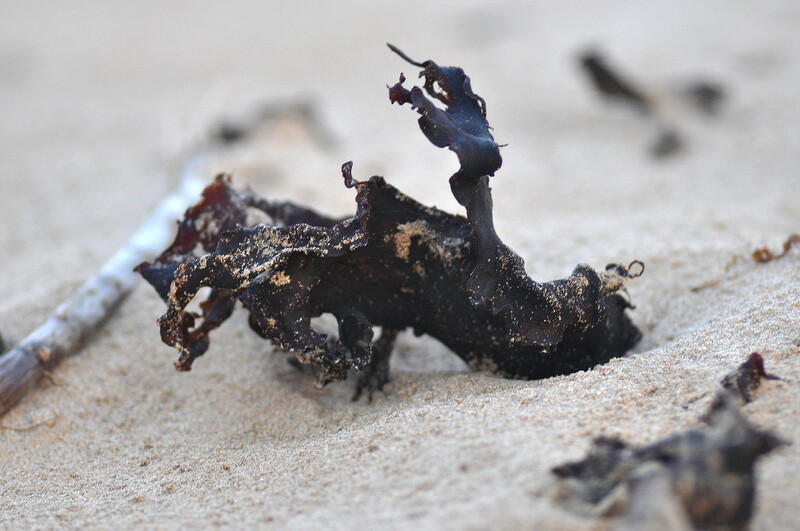 Next along the beach trail was Roman Liebach’s Still Nature. Unlike many of the other SculptureScape projects Liebach’s artwork was much more formal in construction and composition, and not ephemeral. Fascinated by concepts of the natural world VS the human world VS the industrial world, Liebach made the artwork off site and installed it on the day. While his sculptural installation explored themes similar to the other participating artists, it was less successful as it lacked the dynamics captured by making an artwork onsite and allowing the public interaction offered by the sculturescape concept. Wandering back along the pathway between the swing bridge and the camping ground Maria Simonelli’s Reclaim emerged subtly from amongst the natural bushland. Reclaim is a double edged sword, seeking to ‘reclaim’ everyday objects to create new aesthetic forms whilst also ‘reclaiming’ traditional womens’ craft. Repurposed doilies and crocheted pieces hugged the organic flow of tree branches, while small LED lights and candles cast soft shadows creating a sensually tactile sensory environment. AND, of course (self plug) I participated in this category…. and my artwork also examines issues related to climate change and the environment…. I won’t go into here – you can check out what I did in my previous blog post 🙂 But here’s a little pic! PS- the results of my pit firing are available for sale! Overall, it would seem the SculptureScape category artists were largely concerned with themes of climate change, sustainability, the impact of technology and recycling. These themes are, of course, very suited to the ephemeral nature of the SculptureScape concept. Being framed within an ‘here today, gone tomorrow’ paradigm serves to also emphasis the already successful message being communicated by most of the artists. Did you know that as well as making sculpture and jewellery and functional tableware I also make blank gift cards? The cards I make feature images of my artwork, images of ephemeral artworks or original hand drawn images – not pictures of them, the actual drawings. All gift cards are blank so that they are ideal to compliment any gift on any occasion for any gender – as well as being a unique gift within themselves. All cards come with an envelope in a protective plastic sleeve, and are frameable once the gift giving is over. The following images are some cards that feature in my Etsy Shop, where you can buy online, and over the next week or so I will be adding more cards in time for Mothers Day. 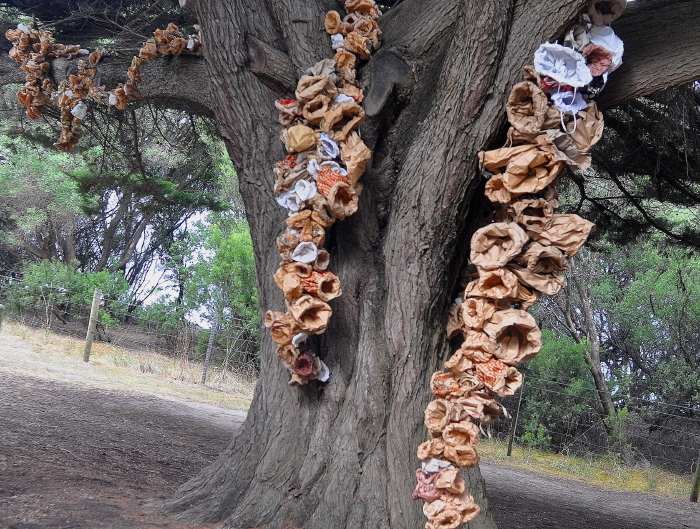 This video is a walk through (as the viewer would experience it) of my PhD installation which consisted of sculptural ceramics installed in the natural environment at my property in Dunnstown, Victoria, Australia. The research and subsequent installation was based within a feminist framework, supported by the theories of new physics and evolutionary psychology which purports recognition of universal symbols and universal connections. 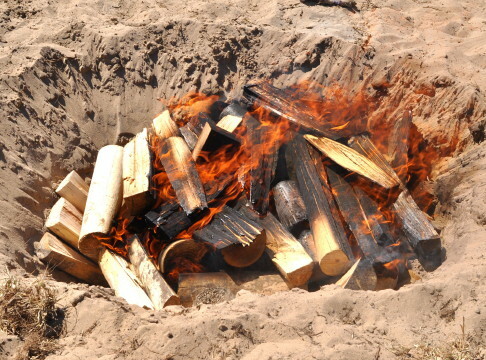 Clay was used as an organic material to capture the innate connections and nuances that humans have to the environment. Installation as an art method was used to create an environment which could act as a conduit to the viewer re-establishing their inborn understanding of their place in the universe. My actual PhD can also be downloaded or read online at Academia.edu or at the University of Ballarat. This weeks photo challenge theme is quite convenient – for me at least! Last weekend I spent Friday and Saturday night in Apollo Bay with my partner Strobe, because he won second prize in the Greens Art Prize, and two nights accommodation was the prize (pretty good prize)! Apollo Bay is a coastal town along the Great Ocean Road in Victoria, Australia, and is a popular tourist destination for international and local tourists. During the winter months its resident population is around 2,000, but come summer this explodes to 15,000 – 20,000! Luckily we were there just before this explosion. So the photo challenge ‘renewal’ theme has a double meaning for me : first it coincides with a relaxing and renewing weekend away, strolling along the beach, sleeping in, coffee on the promenade, yummy restaurants and taking photos! Secondly, the constant renewal of the environment by Mother Nature. 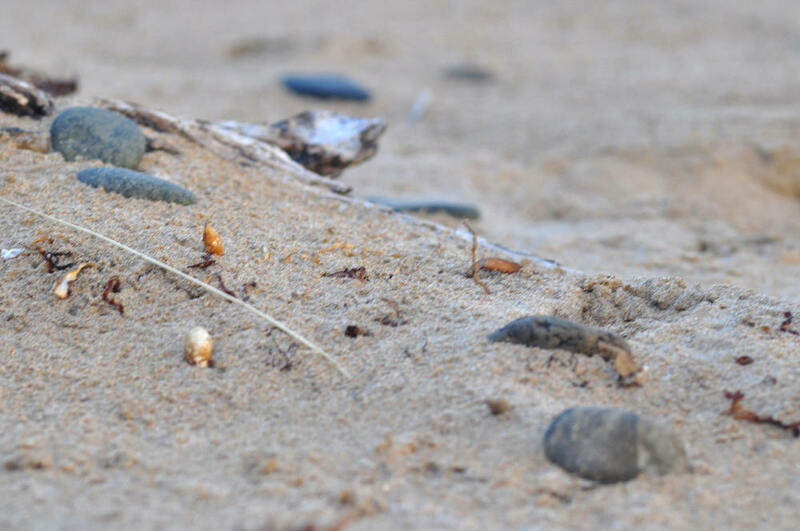 As well as personal renewal, the photos I am sharing depict detail images of the ever changing shoreline. 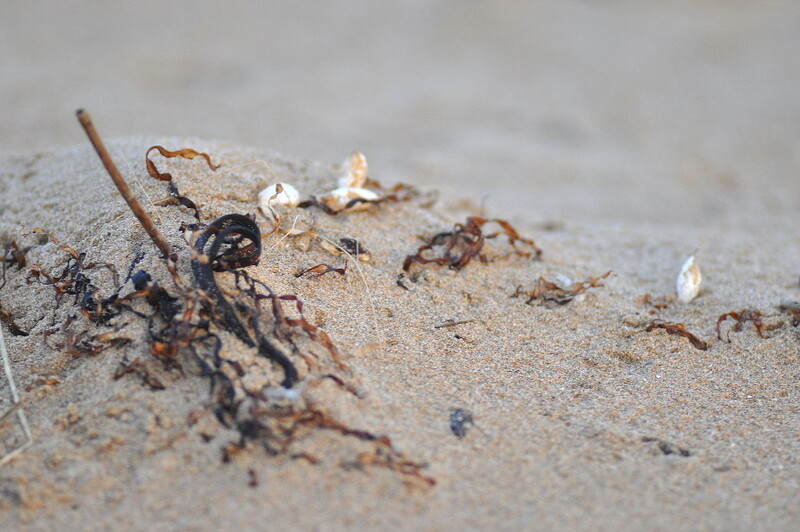 As tides flow in and flow out coastal debris becomes ensnared in damp sand, forming mini organic installations. And each day these spontaneous ephemeral artworks created by Mother Nature are renewed, fresh and invigorated for the next beach comber. As I am currently living in Bentleigh, and not my home, I don’t have access to all my camera lenses, so for this weeks challenge I’ve dug up some images from a couple of years ago that I took while undertaking an artist residency in Beaufort, Victoria. 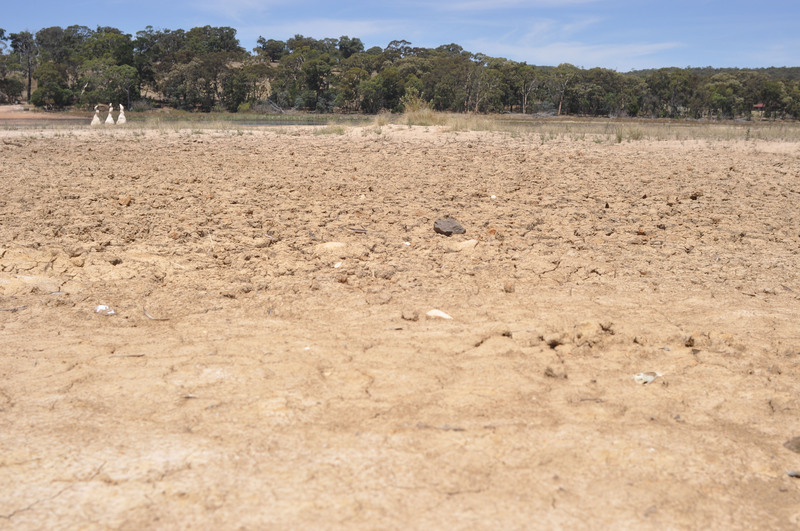 At this time large parts of Victoria were under drought conditions, and many of our waterways were extremely low, if not dried up. The aim of this residency was to draw attention to the environmental impacts of climate change by creating an installation on one of the many regional lakes in the area. I chose Lake Beaufort, one of many rural lakes, which was extremely low at the time. 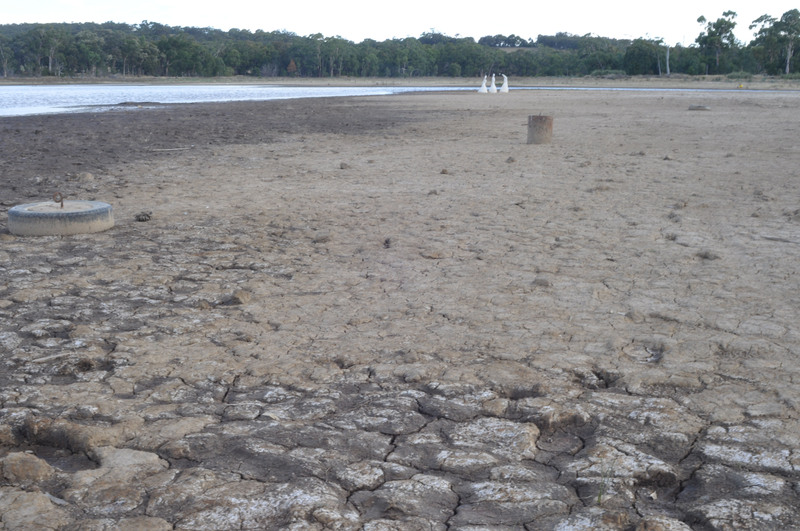 In fact at this time Lake Wendouree, Lake Learmonth nd Lake Burrumbeat were completely dry. 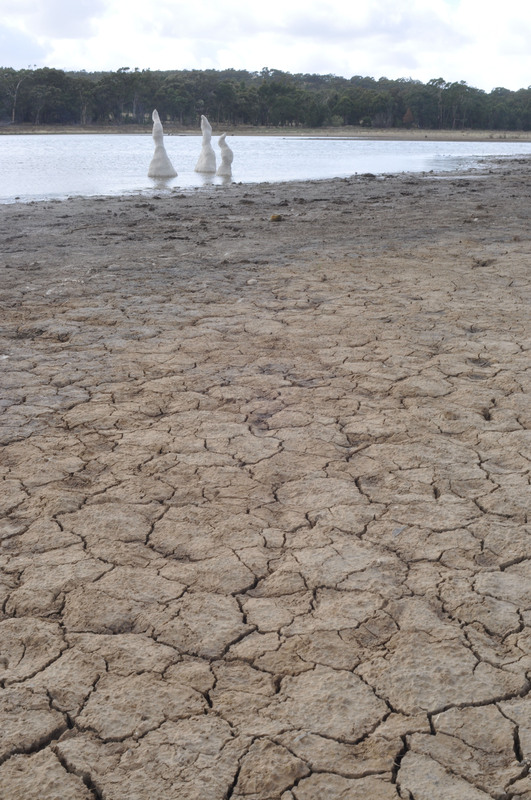 During the first few days of the residency I contructed some large abstracted bird forms from recycled clay on the shore line of the lake – which was actually exposed lake bed. After the forms had dried they were moved into the water and allowed to disintergrate. 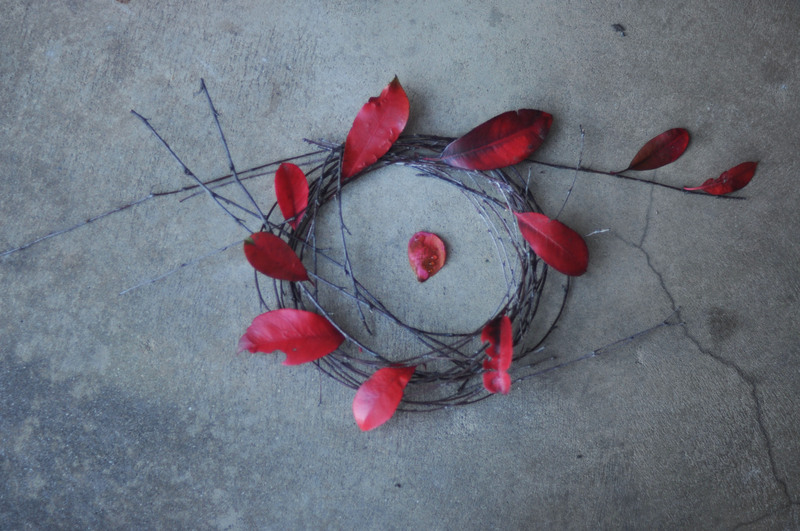 The process was documented photographically, as is the practice for ephemeral installations. Many of the photos I took using the near and far method in order to highlight the exposed lake bed. An exhibition of selected photographs from the residency was later exhibited at the Ararat Regional Art Gallery. 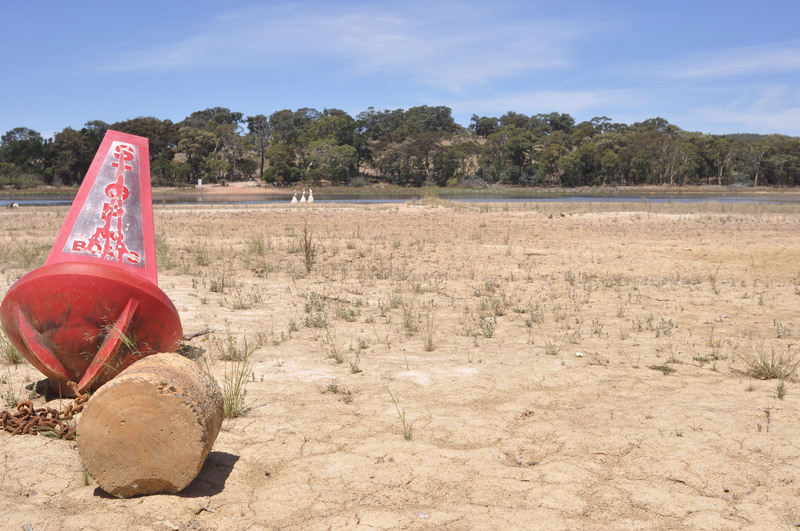 The bouy in the foreground was once in the water, it now sits marooned on the dry lake bed. The length of the chain indicates how deep the water was at this point. The clay sculptures can be seen in the distance on the waterline. The clay birds can be seen in the far distance on the waterline. 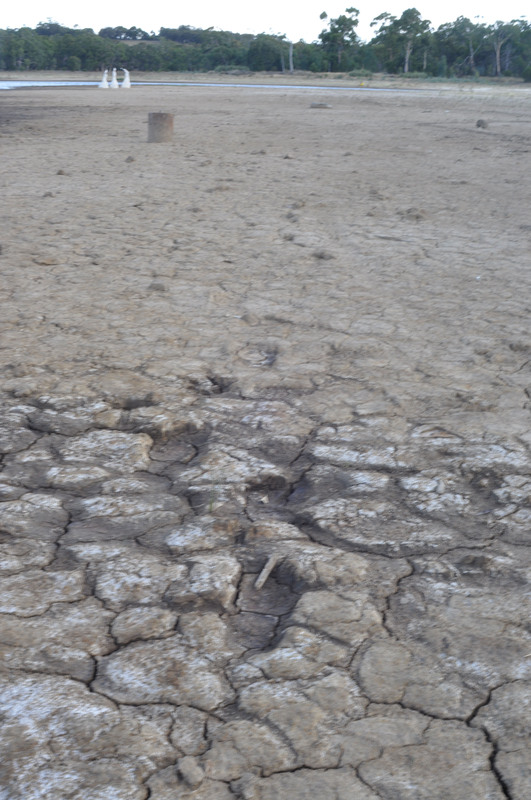 The foreground is dry lake bed. Late afternoon View of the dry lakebed. Debris that was once beneath the water is now exposed. Clay sculptures in the distance. The clay sculptures are now in the water. Currently I am living – temporarily – in East Bentleigh with my son while my sister is on holiday: she is doing base camp on Everest. My son is living here while doing VCE at Brighton Secondary College. A few days ago while taking my dog, Eddy for a walk I collected some natural urban debris from the nature strips on my way home. It has been very windy lately in Melbourne, with lots of bark, leaves, tree branches and twigs, and seedpods littering the streets. On arriving home I arranged some of my gleaned ephemera into an artwork which I documented using my digital camera. The concept of an ephemeral artwork is that it is temporarary, and often constructed of non-permanent materials. I like the soft textures of the small flexible tree branches and redness of the leaves in contrast to the cracks on the concrete. I also enjoy the organic nature of the materials juxtoposed on the cold harsh, yet textured, surface of the concrete. I think I will explore using this image on some gift cards which I may add to my shop on Etsy.